“I think that sanctions right now are at a level that’s a fair level,” he said Thursday as he met with South Korea’s President Moon Jae-in at the White House. The danger now is from the U.S. sending mixed messages over the conflict, Scott Snyder, of the Council of Foreign Relations, said at a nearby event. The Treasury Department announced a new round of penalties on North Korea for violations on importing oil and selling weapons that is “sending signals we’re serious about enforcement,” Snyder said. But almost immediately the White Hosue overrode the department by refusing to impose the penalties to preserve his relationship with Kim, Snyder said. Based upon the president’s comments Thursday, the sanctions that are now in place will not change unless a major event occurs changing the situation on the Korean Peninsula. South Korea’s Moon has pushed for an easing of some sanctions to continue “the momentum of dialogue” and expressed optimism while at the White House over future talks and a third summit between Washington and Pyongyang. On Thursday, Trump did not rule out easing sanctions, saying there could be some leeway on humanitarian aid going into the North, but “this isn’t the right time” for a general lifting of the penalties imposed by the United Nations and the United States. Bringing together Washington and Pyongyang has been Moon’s “signature initiative,” Jung Pak, of the Brookings Institution, said at the forum on Korea at the Heritage Foundation in Washington, D.C.
“If a deep rift” between the United States and South Korea appears, Moon has the most to pay politically” since he would be up for re-election next year. The one positive to arise from the aborted Trump-Kim summit in Hanoi was confirmation that Kim’s highest priority was the removal of sanctions, she said. Kim “told us what our leverage was.” He was “laser-focused” on their lifting and expected his relationship with Trump to be sufficient to see movement in that area. But the all-or-nothing apparoch to the negotiations in Singapore and Hanoi showed their inherent weakness, Pak said at the session that coincided with the Trump-Moon talks. “I don’t think either side came with a Plan-B,” as to how to proceed if the other side didn’t budge on the largest issues on the table – dismantling North Korea’s missile and nuclear weapons programs and the lifting of the sanctions. The same problem hangs over any future summits, Pak said. Snyder was skeptical. “We don’t know if [the North Koreans] can do a U.S.-Soviet style arms agreement” where the issues are already defined and agreed upon, and the talks lay the groundwork to reach those definitions. “North Korea needs to understand the full range of sanctions [it is under],” Olivia Enos of Heritage said. There are differences between the United States’ and United Nations’ sanctions. Among the key differences are the American insistence upon human rights’ issues being addressed. This is a tool Washington and Seoul should use in any future talks with Pyongyang, Enos said. 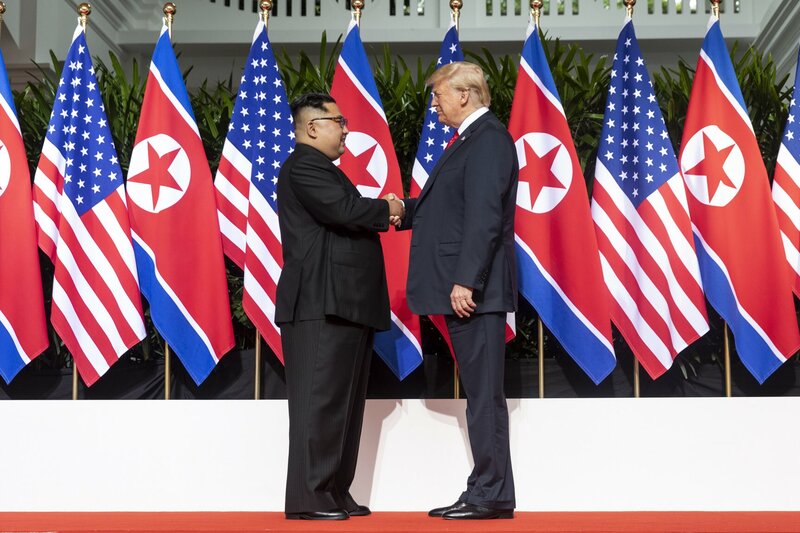 North Korea’s use of its prison camps to provide free labor for its weapons programs and prisoners to test the effects of chemical and biological weapons are examples of how human rights are directly tied to security issues, Hill said. “Maximum pressure is what brought North Korea” to the table in the first place and should be strengthened to make it negotiate in good faith in the future, she said. Answering an audience question, Hill said, “there are a lot of ways we can put pressure on North Korea.” Sanctions over violations on nuclear testing are only one avenue, and public raising human rights concerns as an issue that Kim’s regime must address before talks proceed is another. “We’re OK” with “where we are now” in relations between Washington and Seoul and between the allies in Europe and the Pacific and Pyongyang on maintaining sanctions and definitions of critical negotiating terms, like “denuclearization,” Pak said.